On Wednesday 24th August, 2011 the Ballinrobe Archaeological and Historical Society will host a free talk/walk on the highlights of Ballinrobe's historic sites. This will start at 2.30 from the local Library, which is off Main Street and through the large archway beside the South Mayo Family Research Centre. 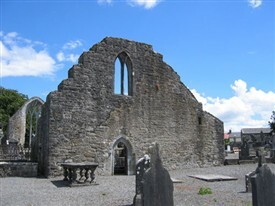 Depending on the weather, the tour may be indoors or outdoors and may include the history of St. Mary’s Church of Ireland, which is much older than contemporary literature records, Bower’s Lane and its significance to the town, pre piped-water, or see some of Ballinrobe’s architecture including the very well preserved Market House or perhaps sense a hint of some of the interesting characters that made up the community of this Historic Town. Did you know that there is a cast iron plaque of the Cuff family (local landlords) in the premises of the family that once owned the oldest pub in Ballinrobe or that Harry Potter’s look-a-like is preserved forever in a stained-glass window in town? We might drop in to see them! Our military history might be investigated with two interesting sites for both a cavalry and infantry barracks in town. Image the business this brought to south Mayo’s oldest town! Soldiers, their families, horses, laundry, shoemakers, tailors, book sellers, saddlers, butchers, egglers, farmers, gardeners, pharmacies, doctors, legal-eagles, judges, peace commissioners, police, blacksmiths, coach-makers, farmers, tax officials, butter and poultry suppliers, clergy, builders, stonemasons, carpenters, fuel suppliers, post and mail personnel, jailers and supervisors, dressmakers, feather suppliers and weavers, translators, scribes and so on. Imagine the excitement of market day or a day at the races; all the news and gossip from around the area…the banns, marriages, deaths and baptisms, or who might have got a letter from America or further a-field! 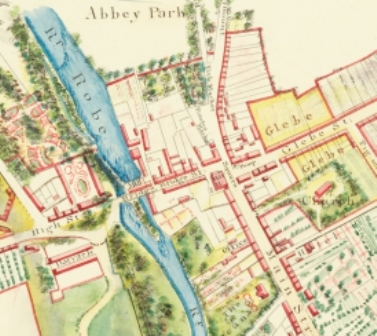 A workhouse, a charter school, landlord’s houses, an Abbey and site of the original Norman tower- house, mills and breweries, jails and railways are all there for investigation, plus part of the recently refurbished Bower’s Walk which was developed in the 1850’s with its underground passages bringing back memories of adventures by children of Ballinrobe. No health and safety issues then! However, one has to wait to see what will be highlighted on the day. The weather and the interests of the participants will be considered. Why not join us and if nothing else, you might meet an interesting stranger who may share their memories of Ballinrobe. Ballinrobe is our place and for those who know and love the town it could be fun for an hour or two reminiscing on the past. Further information on some sites available in the 'Places' category on this site. This page was added by Averil Staunton on 17/08/2011.